In case you haven’t heard, Taco Tuesday is practically a holiday. It really doesn’t matter where you’re at, some taquería or local restaurant is boasting of ‘the best tacos in town!’ (Taco Bell DOES NOT count – don’t even get me started). When it comes down to it, everyone loves tacos, period. You just can’t argue with that. I mean, what’s not to love about little pockets of meat, onions, cilantro, jalapenos and salsa? Am I right? 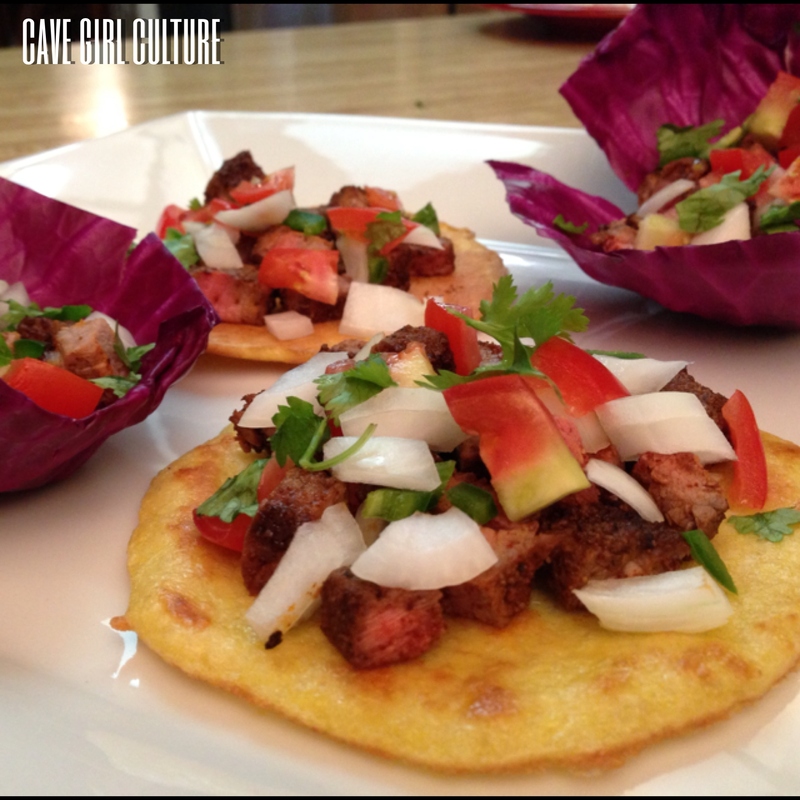 This cave girl has one, teensy little problem with the traditional taco. You guessed it. The famous ‘corn or flour tortillas?’ question. Well, how about neither? 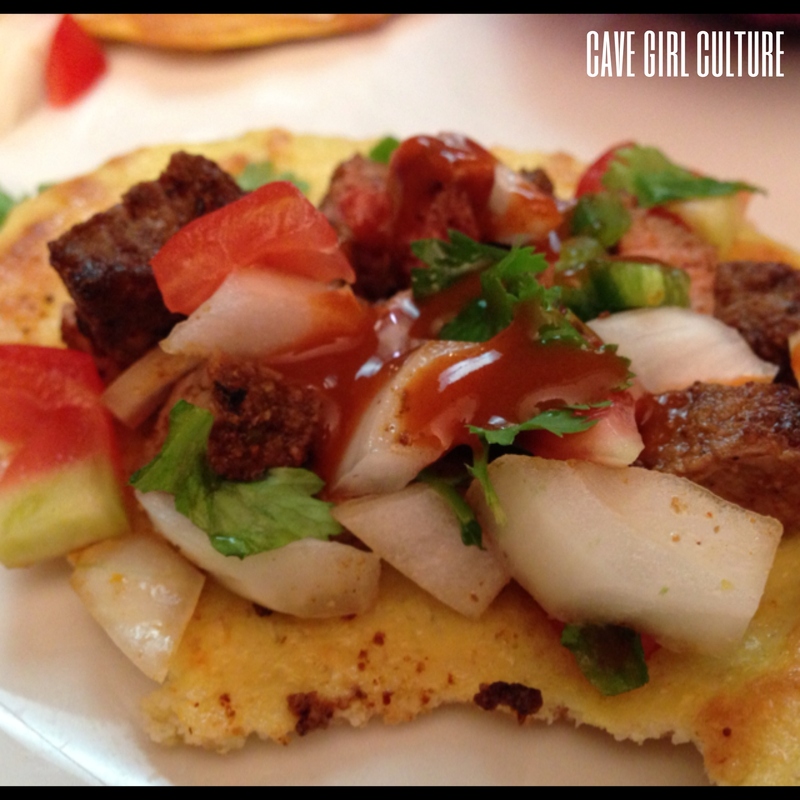 Let’s start by discussing the corn tortilla. 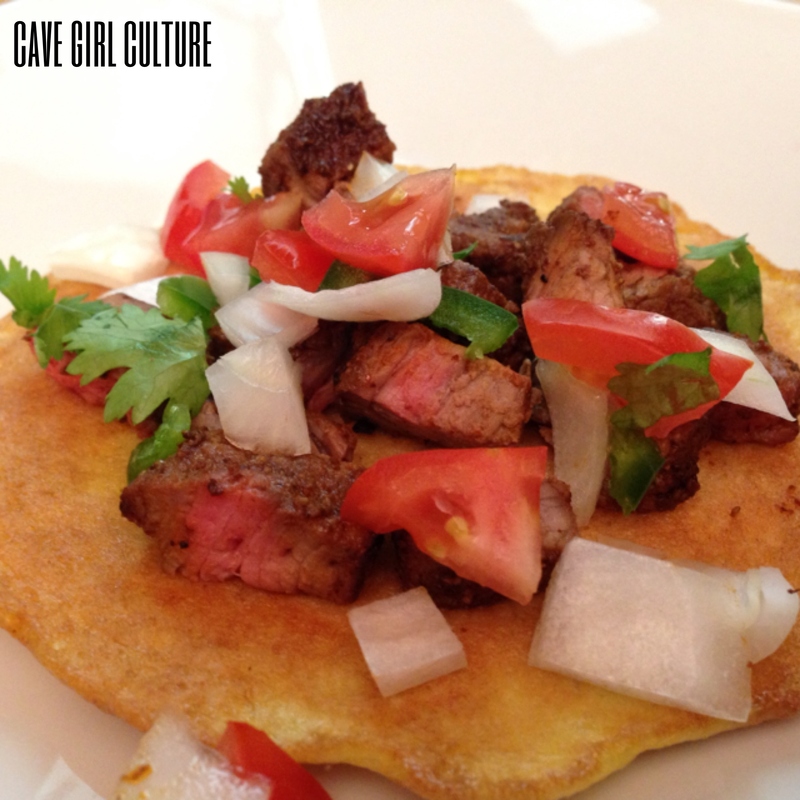 The traditional corn tortilla is made of finely ground corn and water. Not so bad, right? You may already know that corn is considered to be a Paleo ‘no-no’ due to it’s damaging effects on the gut, although there ARE worst grains to consume.Yes, dried corn is considered a grain! #FunFact. Unfortunately, the majority of us are not grinding our own GMO-free corn into corn flour and making our own corn tortillas, which obviously would be the best choice if you chose to consume. Which means, the typical corn tortilla is probably very processed and chemical laden, therefore harmful to the human body. The white flour, or wheat flour, is a little bit easier to dissect. This tortilla is made of ground wheat and water, similar to the corn tortilla. Wheat contains gluten, which also is proven to be damaging the gut flora and is strongly associated with cancer, heart disease and autoimmune diseases. And again, the typical tortilla we would find in the grocery store and some restaurants is probably processed with a bunch of fun chemicals. So let’s stay away from these, yes? Crack eggs in small mixing bowl and whisk away! Add the almond flour and sea salt and continue to mix until well incorporated. The tortilla batter should be very runny. Heat up the olive oil in a skillet, and when the oil is warm, use a paper towel to spread it evenly around the pan. Using a small measuring cup or large spoon, spoon out approximately 2 tablespoons of batter into the skillet. Gently fry the tortilla on each side – about 1 minute on each side. It should be a light golden brown when done. This batter should make 4 small tortillas. **See Note below. The first step in creating these lovely little pockets of goodness, is to season the meat. To do so, combine all the seasonings in a small bowl. Use 2 tablespoons of the taco seasonings to season 1 pound of meat. Store the extra seasonings in an airtight container and use on your eggs. You won’t regret that decision, trust me. Rub the meat (giggle) with the taco seasonings, and drizzle with a little olive oil. Heat olive oil or coconut oil in skillet and cook your meat to desired doneness. Squeeze juice 1/2 lime over the meat when done, and let the meat rest for about 10 minutes. 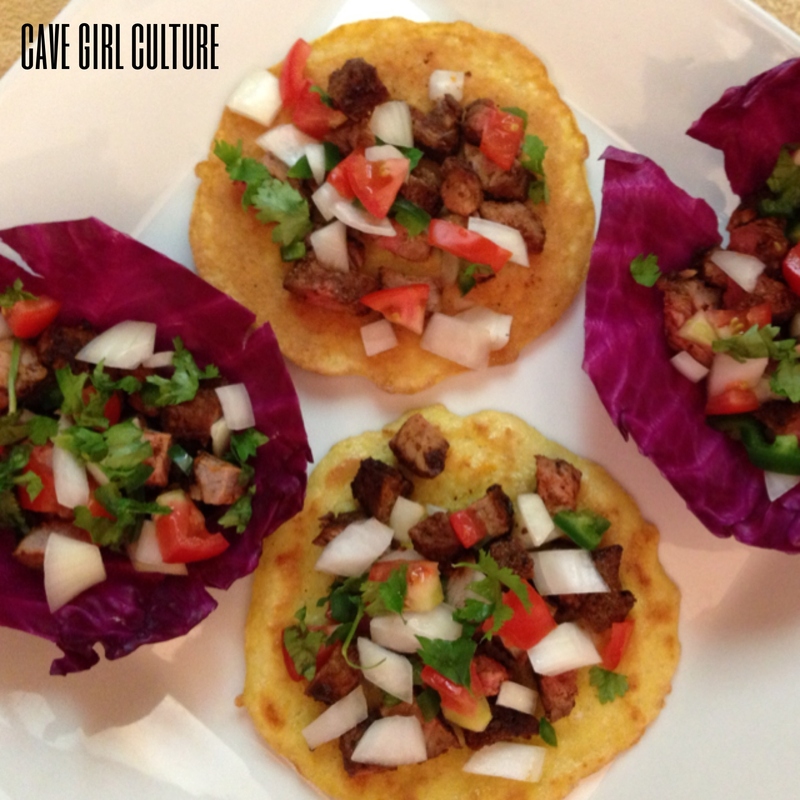 Dice the meat into small chunks, about 1 centimeter, and spoon onto the tortillas. I used about 1-2 tbsp. of meat for each tortilla. Top each tortilla with onion, jalapenos, tomato, and cilantro, then add a squeeze or two of lime juice. The key to tacos is simplicity. Don’t overdo it! Let the ingredients speak for themselves. I suggest making the tortillas while the meat is resting. They will cool very quickly, but are tasty whether they are fresh off the stove or have cooled a bit. Need another vehicle to move food from point A (the plate), to point B (your mouth)? Use cabbage, as pictured above. Purple cabbage did the trick for me, adding not only crunch, but also color to my plate. 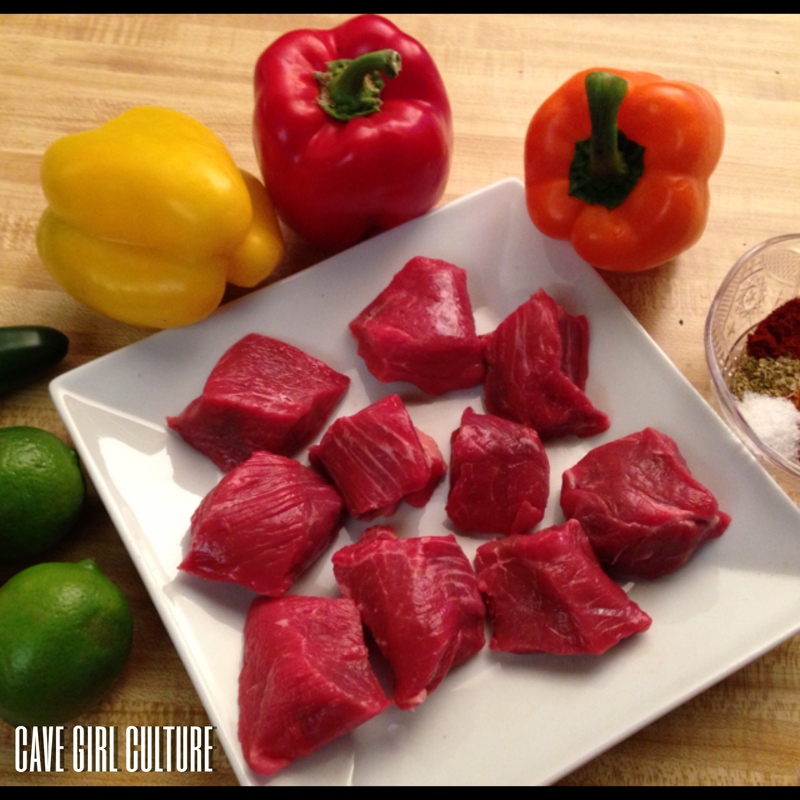 If you want more ‘kick’, add your favorite Paleo approved hot sauce. Personally, I feel that took the tacos from GREAT, to AMAZING. When you’re friends, coworkers or family throw Taco Tuesday in your face, now you’ll be prepared. You should be very proud of what you are doing here. The photos are wonderful and the writing is concise and witty. Cave women all around the world should read your blog and learn a few things like I have. Great job Stef !! Thanks Rhonda! You have no idea how much that means to me. 🙂 I hope you guys find some recipes on here that you like, and call or message me if you have any questions! Steph! It’s Caveman’s little brother, Caveboy. Have you made a hot sauce, particular one that can rival a Sriacha style sauce. Me & Shorty are doing a cleanse for 12 days and the diet excludes vinegar, which ALL my favorite hot sauces have. Whaddup!? Keep it up Mama, you’re writing style is great! http://nomnompaleo.com/post/36060636540/paleo-sriracha. It looks pretty darn good!